All these are valiant attempts to solve the problem of large-format plastic coil binding. But most of the time for a document that is 40 millimeters thick, inserting the coil by hand is the only way that really works. Secret #1: Use 3:1 pitch plastic coil. If you punch that same document using a 3:1 pitch die, you have only 33 holes punched on an 11” binding edge. Because you have fewer holes, you have reduced the friction. Additionally, because the coil is spaced wider apart, 3:1 pitch plastic coil can be manufactured with thicker filament. This makes the plastic coil more rigid and easier to insert. Secret #2: Use an oval punching pattern (3:1 pitch, of course). When working with 3:1 pitch plastic coil, it is recommended to use an oval punching die (6.5 mm x 5.5 mm). The key to this is using an oval hole die, trying to utilize a 3:1 pitch Wire-O round die doesn’t work well with these large books. 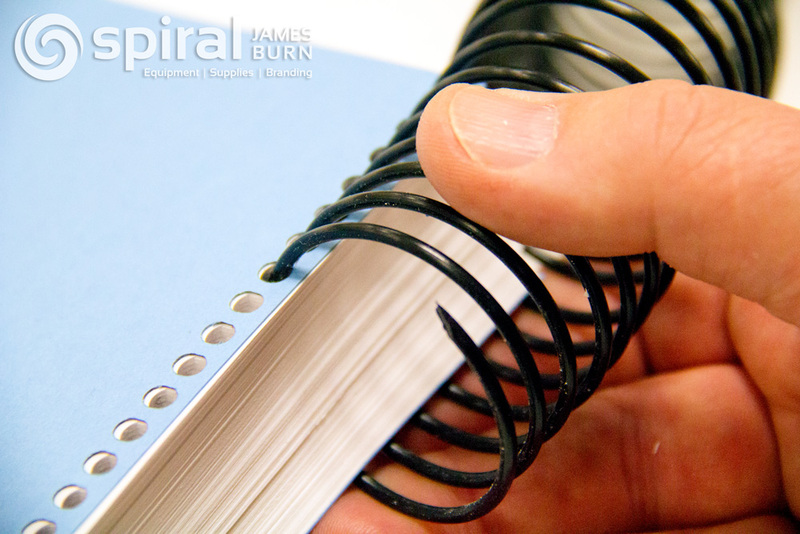 When a thick book is being bound, the book will curve to follow the curve of the coil. As this happens, the punch hole “opening” is reduced. The expanded height of the 6.5 mm x 5.5 mm oval hole provides sufficient space to keep this “opening” as free and clear as possible, so that the coil can wind its way through the punch holes unobstructed. Secret #3: Use the right tools (Here are a couple that work for us). An old Chinese expression from an ancient text called the Analects of Confucius states “One must have a good tool in order to do a good job.” This is so true! We know that using 3:1 pitch coil and punching dies makes large document coil binding easier than using 4:1 pitch. There are also some special tools that will also make a big difference in the inserting process. • Slantis Coil Binding Sleeves: These are designed to securely hold the document while providing for the curved binding spine that conforms to the radius curve of the plastic coil binding element. This makes coil insertion much easier, especially on larger-sized books. • EZ Flex 100 Coil Inserter: This plastic coil inserter has been designed for use with the Slantis Coil Binding Sleeves for fast coil insertion on all plastic coil binding sizes, especially large coil documents. Unique in how the book stands upright in the slantis sleeves, these sleeves maintain the curve of the spine and the angle of the holes to match the coil. It has adjustable roller positions for high performance and easier coil insertion. James Cash Penney, founder of the famous North American chain of department stores (JCP, also known as JC Penney), once wrote: “The keystone of successful business is cooperation. Friction retards progress.” The same concept is true with successful coil binding. By having supplies and tools that cooperate and retard friction, plastic coil binding for large documents can be done quickly and easily. Save time, money and aggravation while increasing profitability by making a small investment in new punching dies and binding tools for large-format plastic coil binding jobs. More to articles and videos to come soon on Large Format Plastic Coil Binding! Credits: This article was contributed by Spiral James Burn’s Product Manager, Joe Bondonna. Joe has over 25 years experience in the post-print finishing industry and loves to help customers find the perfect fit their finishing needs. You can connect with him on LinkedIn. The photo (inserting plastic coil by hand) was taken by Mike Bossard. The “hand talent” provided by Joe Bondonna.